The Connected Audience conference brings together experts and practitioners from the museum and culture sector from around the world to share and discuss cutting-edge thinking and innovative practice in audience research and development. The main goal of the conference is to examine how audience research and evaluation can support museums and other cultural institutions in gaining a greater understanding of their audiences. By using these tools, institutions will be able to increase participation and better inform their strategic development and overall cultural practice. 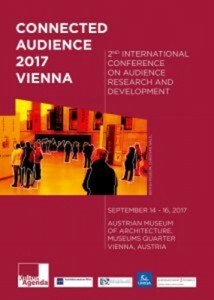 Target Group: The conference aims to bring together audience research and evaluation experts, educational academics and practitioners, museum and cultural institution professionals, curators, marketers, educators, managers and directors and anyone who is interested in developing visitor focused institutions. Mid-career professionals are particularly welcome. Organising Committee: The conference is jointly organized by the Institute for Learning Innovation and KulturAgenda – Institute for Museums, Cultural Enterprises and Audiences.